Turn on your phone and gather ‘round. 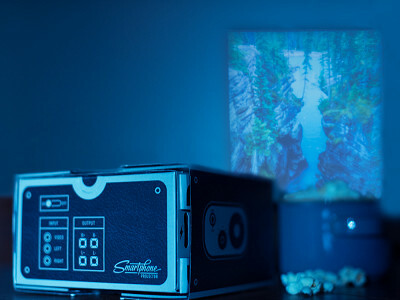 The Smartphone Projector turns any surface into your own private cinema. Luckies of London makes this simple DIY projector out of sturdy cardboard and a glass magnifying lens. The Smartphone Projector kit shows off pictures and videos on a surface much bigger than your phone’s screen. Building the Smartphone Projector is a great educational tool. Simply follow the instructions and learn the principles behind lenses and light projection. Dim the lights, turn up your phone’s brightness, and you’re ready for a show. To focus, use the sliding-box design to manually adjust the picture. There’s a handy opening in the back of the box to charge your phone while projecting, Another opening lets you connect to speakers, too. Cleverly designed for today’s devices, The Smartphone Projector pairs analog with digital and resurrects the bygone charm of watching home movies. Hello from Luckies of London! We're so happy to have our Smartphone Projector on The Grommet. Let me know if you have any questions, and I would be happy to answer them! 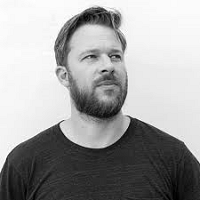 Hi everyone, Blaise here from The Grommet team. I had a blast testing out the Smartphone Projector. I particularly loved how you can manually focus the picture by adjusting the sliding box design. It really gave me a greater appreciation for how projectors work at their core. That, and the neat effect a classic lens gave to the Jacque Cousteau video I watched was a definite plus. This is a creative idea, but I did not see any mention of the size phones that work with this. Some examples would be nice: iPhone 5 or 6? Hi Roger, Kristan here from The Grommet. This is a great question that other members of our community have, as well. Let me take a moment to get the appropriate answer and we will share it with the masses. Hello again and thank you for your patience. The Smartphone Projector is compatible with any device that is about 3" X 6". There is no connectivity or docking required; your device simply rests on a silicone grip pad at the back of the projector. The images are then reflected through the lens at the front of the box and displayed for your enjoyment. I hope this helps and let us know if you have any further questions. @Roger Hi Roger, Scott from Luckies here. The Smartphone Projector fits both the iPhone 5 & 6, even in the thick Otter Box cases. These actually help the phone stand up nicely in the Projector. The new iPhone 6plus does not fit our current model. The unit is made of cardboard and will bend to allow this phone to stay inside, but it is a very tight fit. All Droid phones, with the exception of the Galaxy 4 & 5 and the notepads currently fit comfortably in the Projector. I hope this helps with your decision. I think this is a terrific product ... can anyone comment on the quality of the picture? @Sonia Hi Sonia, since the Smartphone Projector utilizes traditional projector techniques (a light source magnified by a glass lens), the quality of the picture won't be as high as digital projectors. However, I liked the slight fuzziness around the edges of the picture as it gave it a neat vintage quality. Hi Chris, The Smartphone Projector is compatible with any device that is about 3" X 6" so the 6+ may be a little bit of a tight fit. Since the projector is made of cardboard, you may be able to flex the sides of the back portion that holds your phone if you feel comfortable. @Chris Hi Chris, Scott from Luckies here. I've tested this personally, and the iPhone 6plus is a little too big for our current model. Because the Projector is made of cardboard, it will actually bend and accommodate the 6plus, but there is no room for the power cord or any additional accessories. I hope this helps. What type phone works best in this box? I'd like to order for Christmas but need to know what type phone has best resolution. The Smartphone Projector is compatible with any device that is about 3" X 6". There is no connectivity or docking required; your device simply rests on a silicone grip pad at the back of the projector. The images are then reflected through the lens at the front of the box and displayed for your enjoyment. @Elizabeth Hi Elizabeth, I tested the Smartphone Projector using an iPhone 5s with a heavy-duty otterbox case, and it worked great. 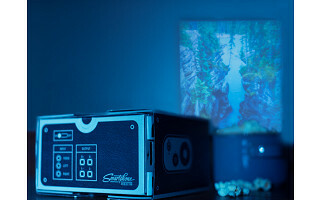 Since this is a traditional projector, the quality of the picture depends more heavily on the strength of the light source and the darkness of the room. I recommend turning the brightness on your phone all the way up to get the best quality. Also, it helps to project onto a white surface. @Elizabeth Hi Elizabeth, we've found the new model Droids and iPhone 5 & 6 work very well with the Projector. The newer phones have the best video quality and are able to lock your screen in the correct orientation to watch movies or slide shows. Can you stream movies on the Projector? For example, could you play Netflix on your phone and use the Projector to watch? Hi Cindy, great question and you sure can! As long as you are connected to an internet source, you can project whatever you would normally view on your mobile device. That is the beauty of the Smartphone Projector - its users can keep finding new ways to make this re-incarnation a part of their every day lives. Just make sure you have enough battery or that you plug your device into its charger so that you can watch as long as you'd like. This YouTube video shows how to assemble it and mentions the size dimensions of the phones that it fits. Hi Kelly This is a great 3rd party review. Thank you for sharing it with others! @Robert Hi Robert, you are correct, the lens does invert the image. For videos with subtitles and noticeable writing, it will show up as a mirror image when projected. The projector has a scan-able barcode for FAQ's like this with instructions on how to invert your video on both a Droid and iOS phone in case you need help with this when it arrives. We are also happy to help here at Luckies if you need anything else. I hope this helps. @Scott ...Thanks...didn't even know the phone could do that. This is definitely a contender for the Holidays...or for myself. Seems like a great (and much more economical) alternative to the very expensive digital projectors. Seems like the definition of the video is that of good TV before the advent of HI-Def TV's. Is that correct? Or do you think it is better than that (in a dark room, brightness at max, and not too far from the wall/screen)? @Robert Robert, the quality of the projection depends mainly on the quality of the video you are trying to watch. If the video was is high quality (for example a Netflux video or a VEVO video on Youtube) you should be able to see a projection about 30 inches in a very dark room. The comparison of a good TV type of image (before HD) is a good comparison. Some videos may be clearer. The darker the room, and brighter the video, the better the quality and clarity. I would recommend setting the projector about 6 feet away from the wall for the best picture (image size of about 30-32 inches). Thanks. What a nifty idea. Love that it is made of cardboard which is lightweight and renewable, and not plastic which would be around for eternity. Thinking to purchase for my husband to use when showing his mom things on his phone, usually pictures of her grandkids, but sometimes things she asks us to look up on the internet for her. With this we can show it all to her in a snap! Im wondering about sound. I'm thinking that even if the volume is on high you wouldn't be able to hear it well. I love the idea though. @Cathie Hi Cathie, when I tested the projector I found that as long as the volume on my smartphone was turned all the way up, I could hear the movie I was watching just fine due to the small openings in the back. These same openings double as slots for your phone’s power cable and for your external speakers if you want higher quality sound than your phone provides. Will the projector work with an I-pod? @Sarah Hi Sarah, the Smartphone Projector will definitely work with a regular sized iPod. If your iPod version doesn’t have speakers, you can connect external speakers to your ipod through two small ports in the back of the projector. Turn on your phone and gather ‘round. The Smartphone Projector turns any surface into your own private cinema. Luckies of London makes this simple DIY projector out of sturdy cardboard and a glass magnifying lens. The Smartphone Projector kit shows off pictures and videos on a surface much bigger than your phone’s screen. Building the Smartphone Projector is a great educational tool. Simply follow the instructions and learn the principles behind lenses and light projection. Dim the lights, turn up your phone’s brightness, and you’re ready for a show. To focus, use the sliding-box design to manually adjust the picture.